In a reality so rich with colours, there are in reality no colours. The colours we see indeed depend on the light that enters our eyes from the outside world. Nevertheless, what we actually perceive as red or green originates deep within our brains. Colours are not, therefore, merely «Deeds of Light», as Johann Wolfgang Goethe once claimed; colours are also a product of the self, and we decorate our own personal world with them. We see and produce an apparently endless abundance of colours. Philo of Alexandria was the first to notice this when, in the first century, he marvelled at the colours around the neck of a dove as it moved in the light of the sun. At that moment, something may have dawned upon the man of antiquity which we now accept without question: namely, that the abundance of colours is actually so rich and plentiful that we cannot name all its shades and tones — at least, not without the aid of a systematic order. It is only natural, therefore, that throughout history we have endeavoured to invent a system for colours. We shall be investigating some of these attempts, and in so doing we shall see that there is no clear and final, nor even objective, solution to the problem of arranging the colours of our world into a distinct order. The history of colour systems remains as open as the history of human beings themselves. Colours are ideas. As we progress, moving from the classical world towards the present day, we shall wish to acquaint ourselves with their origin, both in the world about us and within our own minds. At the same time, we shall gradually have to learn to deal with the vocabulary of colour in a more exact way — naturally, without sacrificing its range. To the physicist, «colour» can imply a determinable wavelength, but to the painter it is a brilliant substance on his palette. If we turn our attention to «mixtures», we will be faced with so many possible variations that there will soon be confusion if we fail to determine exactly what, in each case, has been combined. Red and green light, for example, will together form a different colour than red and green watercolours. Aristotle was probably the first to investigate colour mixtures — and in so doing, meet with failure. He arranged for daylight, which is seldom colourless in its effect (we shall be considering this later), to fall upon a white marble wall after passing through a yellow and a blue fragment of glass. After observing the two resulting patches of light and their colours, he then held the blue fragment between the wall and the yellow fragment. When Aristotle saw the green component in addition to the original yellow and blue, he came to the conclusion that green will be formed when yellow light and blue light are mixed together. For a while we may tend to agree with such an addition. However, if we then consider these pieces of coloured glass more closely, we will soon see that something must have been subtracted from the light which passes here. Every time the apparently white light of the sun is made to pass through a piece of coloured glass, a component will be removed. (Using the techniques of modern physics, this can now be measured accurately). If this light has passed through both the yellow and the blue glass fragments, its remnant light will be seen by our brains as green. We will, for a while, leave undisturbed the precisely measurable aspects of the science of colours, in order to explain more about the ideas of the Greeks — ideas which thrive on the experience provided by our senses. Their world is understood as an organic entity, with its colours arising from the continually observed struggle between the darkness of the night and the light of day. Any system of colours must therefore range from white through to black and, as with all first attempts, the simplest possibility is tried to begin with: namely, the straight line. Aristotle’s linear sequence of colours can be observed during the course of the day: the white light of noon becomes tinged with yellow, and changes gradually to orange, and then to red. After sunset, this evening red becomes a purple violet, changing to a night sky which appears as dark blue. In between, green light can sometimes be seen. (It is unlikely that many have observed a green glow at sunset, but there are numerous photographs documenting this). Aristotle’s system, where red is also able to occur less dramatically as a combination of black and white — as demonstrated by the reddish glow in a black steel reflector, for example — may well be as clear and convincing as the «Explanation of Colours» provided by Plato in the 30th chapter of Timaios is complicated. Plato’s basic ideas about our visual perception have little in common with our modern explanation; they are not based on light rays entering the eye, but on rays of vision extending from the eye, thus interacting with particles emanating from objects. Accordingly, Plato introduces the first two basic colours: «It is the white which extends our visual rays, and black is its opposite». Regardless of the clarity with which he begins this exposition, the route leading us to his two further basic colours of red and «radiant» requires a highly sophisticated notion. Plato observes that our eyes become filled with tears when we are too close to a fire. Tears, understood as the unity of water and fire, provide the eye’s moisture, and eventually create mixtures which lead to the diversity of colours. Objects thus acquire a radiance, and begin to glow. Red as the colour of fire is henceforth explained in the following way: because of the flames «by virtue of the ray of blended fire gleaming through the moisture, a colour similar to that of blood is created», and this colour «we give the name of red». With these four basic colours, further mixtures are possible: «The radiance associated with white and red is a golden yellow….The mixture of red with white and black produces the colour purple, but a deep violet will arise if the colour purple is burned and if black is then generously mixed in … If white should combine with the radiance and should then encounter a saturated black, a dark blue colour will be formed, and through the mixture of this with white, a sky blue», and so on, to «yellow brown» and «leek green». 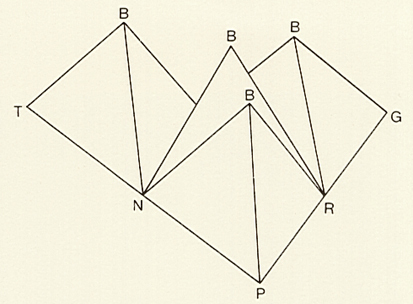 If we wish to sketch this construction and understand it as a geometrical pattern, we can proceed in a personal way, just as Plato did (illustration I and illustration II illustration II. 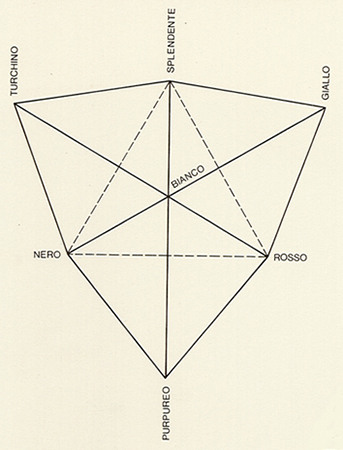 The radiance (Italian «Splendente», here abbreviated to S) must appear alongside the colours and have equal value, only white («Bianco», abbreviated to B) being allowed dominance. 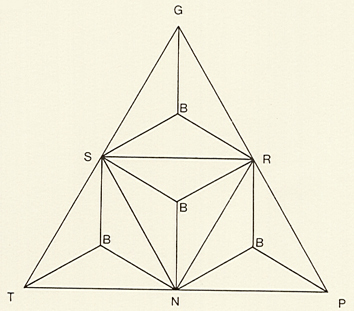 If the tetrahedron is taken as a basis, three of these can be assembled, with their white tips interlocking around a central point to form a secondary triangular plane with a colour appointed to each of its corners. The white centre remains colourless and empty, attracting the tetrahedrons like a shadow, and allowing the colours to be mixed in the way familiar to us. Although he puts forward his construction as a rational theory of colour, Plato has not actually constructed a colour system, and the personal view presented here is only intended as an aid to understanding the colour mixtures he describes. A theory of colour was impossible in his time, although it was certainly understood that within the colours «hidden things concerning harmony and contrast» could be discovered «which rely, for their effect, on themselves alone, and which cannot be expressed in another medium» — as Vincent van Gogh had writen in a letter to his brother Theo, in 1882. Harmony has always been the object of our searching, and a corresponding number of colour theories have been passed down to us. Most widely known is the Pythagoreandesign, which defined a relationship between the musical scale (in either full or half tones) and the position of the planets between the earth and the sphere of fixed stars. 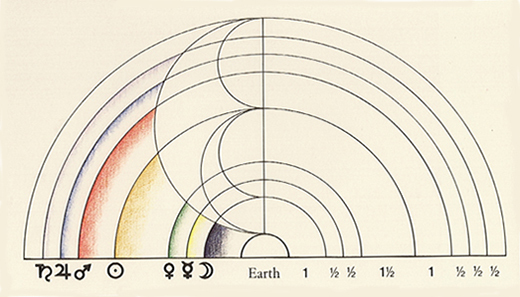 A first colour system could be created by representing this system of harmony as a semi-circle which incorporates the traditional signs of the planets, and then adding the corresponding sequence of colours to this image. To visualise this harmony, we have reproduced such a semi-circle here. A fully complete colour diagram by Pythagoras must have existed, however, because ancient commentators on the writings of Empedocles emphasise that he — Empedocles — proceeded on the basis of such a pattern when he mixed red and wcrsn (óchron) with the primary colours black and white, but this Greek word remains vague and is not translated. (It implies a pale yellow, from which the colour «ochre» is derived.) Aristotle then took the ideas of Empedocles a step further to create the base line, already described and occupied by seven colours, which applies to all colour systems up to the time of Newton. His basic assumption (which still persists in many people’s minds) was to represent colours as actual characteristics of the surface of bodies and not as subjective phenomena produced by the eye or in the brain as a result of the properties of light. Aristotle not only observed colours very accurately, but also their contrasts («De meteorologica»). He was aware that the violet appearing on white wool appeared different when on black wool, and that embroidery appeared different in daylight and in the light of a candle. Aristotle, therefore, had already asked those questions which, only much later, were to be systematically examined and explained by the French chemist Michel Eugène Chevreul. Basic colours: Pythagoras: musical notes are assigned to colours; Aristoteles: colours throughout the day: white, yellow, red, violet, green, blue, black; Plato: white, black, red, “radiant”. Bibliography: Aristotle, «De sensu et sensato», «De anima», «Meteorologica»; Plato, «Timaios», 67D-68C in the Stephanus numbering; A. T. Mann, «The Round Art», London 1979; Th. Lersch, «Farbenlehre», in: «Reallexikon zur Deutschen Kunstgeschichte», published by the Zentralinstitut für Kunstgeschichte Münschen, Volume VII, Munich, 1981.